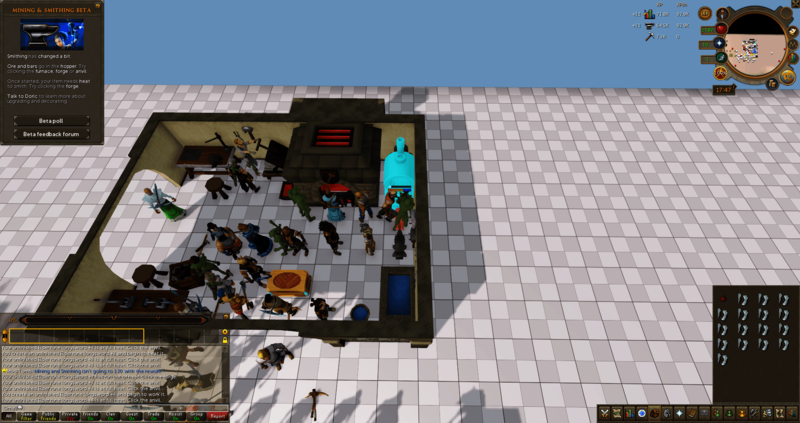 Mining & Smithing are widely regarded as extremely antiquated skills in RuneScape, as Jagex essentially filled out the skill without much future proofing. Both skills were released in 2001 and have received sporadic updates throughout the years to boost their usefulness, but it can hardly be argued that either skill has been left behind as the game has progressed. Requiring 85 mining (of the 99 skill cap) to mine Rune and 85-99 smithing to create its equipment made a lot more sense in 2001 when rune was the best armor in the game (which it still is for non-members) and rune was incredibly rare with two very slowly spawning nodes deep in the player-vs-player wilderness. Mining appears to be going for predictability and ease of access. 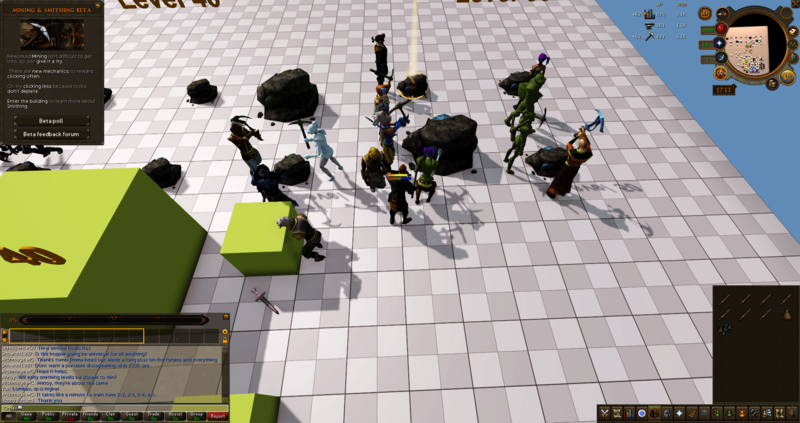 In current RuneScape, mining is essentially handled by dice roll, with every strike giving the chance to collect an ore based on your mining level, the level of the rock, and your quality of pickaxe. For most ores in the game, the rock depletes after one strike and you have to wait for it to refresh before it can be struck again. Under the new system, instead of offering a chance with each strike, Jagex is going for predictability by introducing a timed slider which grants an ore once it fills up, its speed decided by your level, quality of pickaxe, and quality of ore. In addition, it looks like all of the ore will be moved over to a community, non-competitive style with ore nodes that do not deplete. While this does mean that it’ll be more possible to mine while not paying full attention, you’ll still want to check in every so often and click the ore to restore your stamina bar, which will slow down gathering as it depletes. Smithing on the other hand appears to be going for slower production but more returns per creation, so you won’t be pumping out hundreds of swords per hour but the experience you receive per sword will be better than the system that currently exists. Right now smithing is a simple operation of clicking on an anvil with the ore in your inventory, selecting what you want to create, and pressing a button. The new system appears to be promoting creating less items by putting more emphasis on re-smithing what you’ve already created. Items can be upgraded six times up to “decorated,” at which the item can no longer be equipped but can be traded in for a lump sum of experience. According to Jagex staff’s in-game comments, upgrading is intended to be the fast, expensive method of training with leveling by creating items from scratch being the slow, cheap method. Smithing anvils will be situated next to forges, and now you have to keep your metal heated in order to work it into shape (for realism). This translates into a heat meter that depletes as your creation meter progresses, meaning you’ll occasionally need to stop and reheat the metal before continuing. Right now this process is incredibly slow, but there are planned changes to make your heat last longer as you level up. Coal has also been replaced with a new luminite ore as an ingredient to smith adamant and rune armor, and the existing equipment has been condensed down to level 50 with new ores/armor filling in the remaining levels. Finally, there is an idea of convenience that has been sorely missing from mining and smithing since its inception. Since both skills are built around the idea of mass production, a lot of the time is currently spent running with limited inventory (28 spaces plus some limited options for holding coal) running to and from the bank. With this rework, players will be given an ore bag which can drastically increase the amount of time you spend mining before having to go bank. The numbers will most likely change before launch, however during the beta I could fit about 200 tin ore (level 1) and 100 living ore (top level) into the bag. 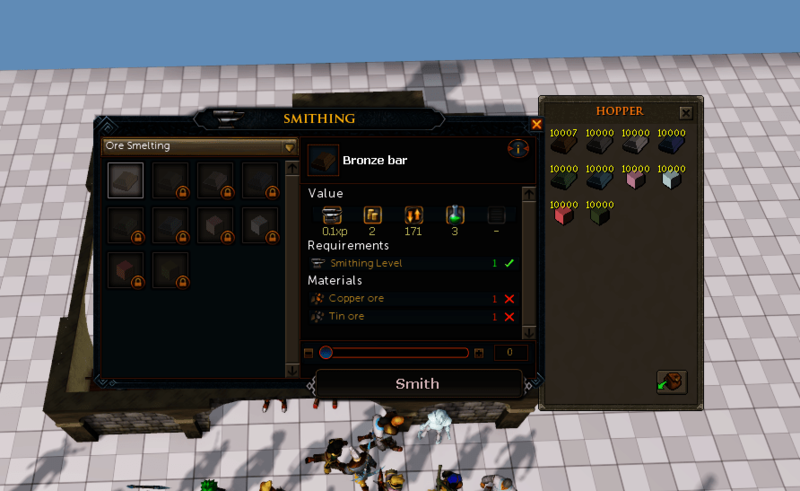 On the smithing side, you’ll be able to fill a universal hopper with ore and bars that can be accessed from any anvil, removing the need to go to and from the bank with a sack full of ore. Looking at some of Jagex’s available design documents, the company is taking into account all of the potential issues that this rework will create, including possible threats toward the value of existing, non-craftable equipment. I’m looking forward to how this new system will shake up a system that has more or less stayed the same for the last seventeen years.